An algorithm is an illustration of a series of medical decisions that address certain patient specific conditions outlining appropriate responses intended to lead to an outcome. The goals of an algorithm are to identify diagnostic alternatives, treatment options, and outcomes by weighing decision benefits against risks and costs. These algorithms can be explicit and published based on best evidence such as in Fig. 1 or individual critical decision making based on expertise and experience. Decision pathways reach knots or nodes, from which several options are available. A primary benefit of a well – developed algorithm is that it focuses the reader on the critical decision points in any clinical scenario and specifically lists the input data that leads to a decision. Algorithms can be applied to specific problems, processes, or diseases. They allow for evolution of a disease related topic with new information or clinical conditions that may affect decision making later in the time course of a situation. They can convey the scope of a clinical condition from presentation, through testing and assessment, followed by a clinical judgment and action leading to an eventual outcome. Annotations are added to appropriate points on the algorithm and are necessary for all decision nodes. The purpose of the annotation is to explain all critical factors affecting decisions in as concise a manner as possible. The primary advantage of an algorithm is that it can summarize an evidence based guideline into an easily and quickly available practice protocol for use in the clinical care setting. Fig. 1 is an example of such an algorithm published by the Western Trauma Association. 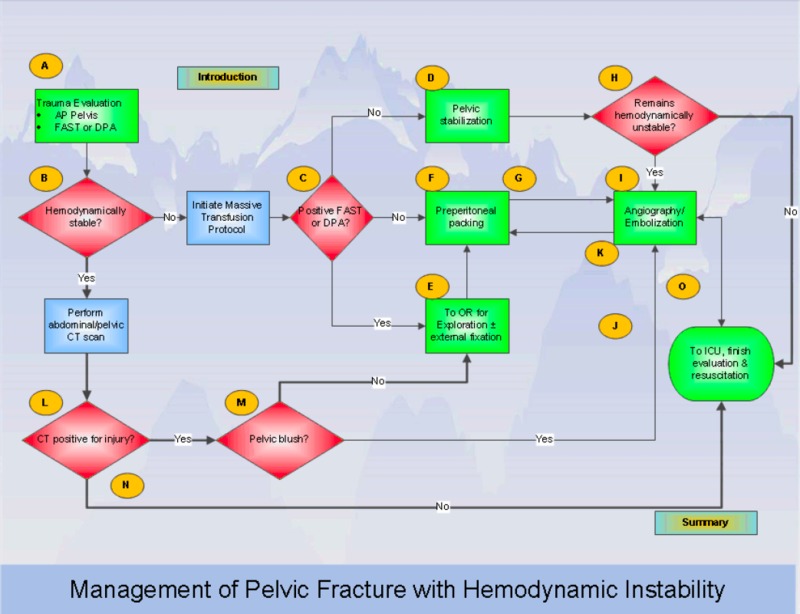 WTA Pelvic fracture management algorithm. In countries such as Australia which have very low volume of GSWs to the abdomen, there is a lower threshold for explorative laparotomy versus selective conservatism. The latter may involve observation for peritonism/bleeding and/or performing CT to look for tangential injury without peritoneal violation as is done in high penetrating GSW volume North American trauma centres. CT can be used to ascertain bullet trajectory and can assist in detecting retroperitoneal injury. In general, management of GSWs such be based on objective physical examination, findings and diagnostic investigations and not on entry and exit sites or sizes. 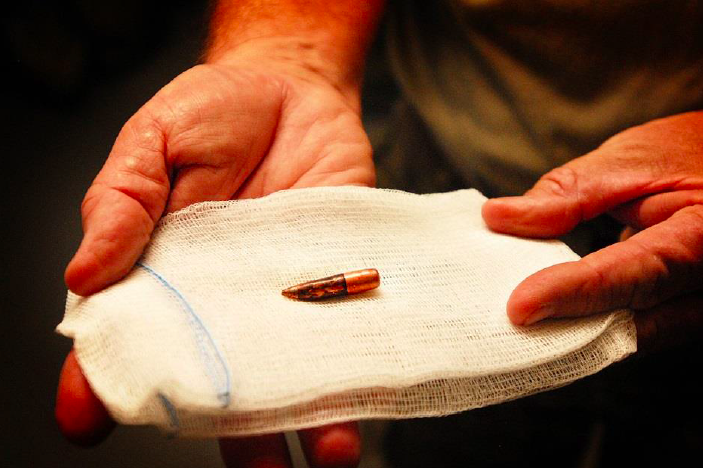 To retrieve the bullet, or not to retrieve in Operating Theatre? There are only a few indications to retrieve the bullet. These include bullets found in joints, CSF, or the globe of the eye. Fragments leading to impingement on a nerve or a nerve root, and bullets lying within the lumen of a vessel, resulting in a risk of ischemia or embolization, should be removed. Rare indications are lead poisoning caused by a fragment, and removal that is required for a medico-legal examination. In all other cases the indication should be critically reviewed. Many prehospital teams carry refrigerated blood. This can be warmed with the Buddy Lite (Fig. 3). 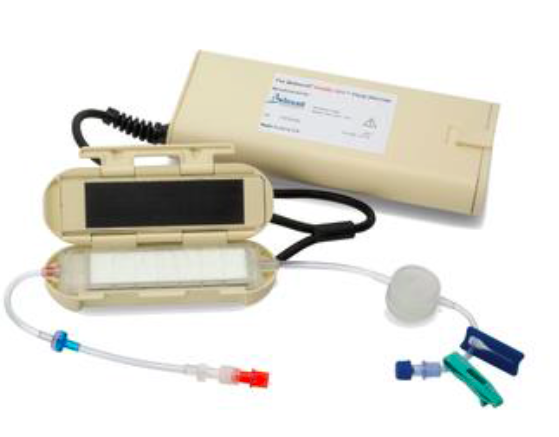 The Buddy Lite can heat 4.4 liters of fluid or blood to 38°C on a single charge. Its major limitation is that it is unable unable to heat fluid that is given rapidly. As well as ordering INR/aPTT all major trauma patients suspected of bleeding should have fibrinogen level sent. Hyperfibrinolysis in major trauma (detected by fibrinogen level/viscoelastic tests) is associated with worse outcomes. It is treated with cryoprecipitate transfusion. ‘Code Crimson’ is a term that has commonly been used by hospital-based teams managing patients with life-threatening haemorrhage that is refractory to resuscitation. The purpose of a ‘Code Crimson’ activation is to streamline patient access to definitive intervention, including an operating theatre or interventional radiology suite. This has recently been formalised in NSW and can be activated by prehospital teams. Patients who fail aWPTAS with brain injury and who do not have a surgically evacuable intra-cranial lesion are at high risk of suboptimal management. Amnesia is only one symptom and symptoms may also include fatigue, dizziness, headache, cognitive and psychosocial changes. These patients may acutely require referral for in-patient Brain Injury Unit management prior to rehabilitation. Emergency Physician, Prehospital & Retrieval Specialist. 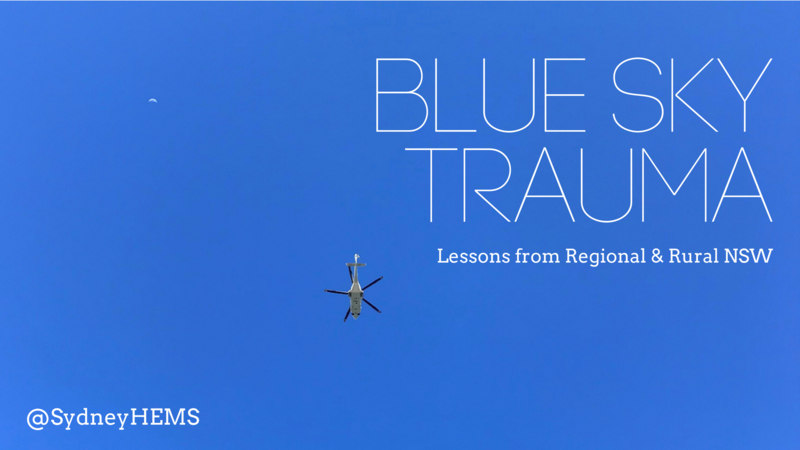 This entry was posted in Cases, Trauma and tagged blue sky, FOAMed, Trauma, umbara base hospital. Bookmark the permalink.